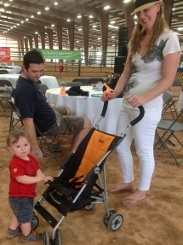 The motto of the Dripping Springs Chamber of Commerce "it all starts here" was clearly demonstrated on Sept. 14 at the 6th annual Dripping With Taste: Wine & Food & Arts Festival at the Dripping Springs Ranch Park Event center. 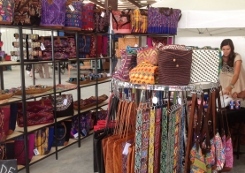 While the facility is still under construction, the organizers made the best use of the space available thereby reducing inconvenience to participants. 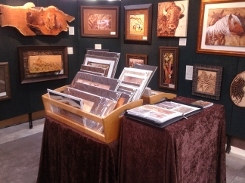 Nearly 3,000 attendees had the opportunity to taste wines from 24 wineries plus a cidery and a Texas sake company; sample locally brewed beers from 5 different craft breweries; devour delicious food samplings from 17 Hill Country restaurants and caterers; examine the works of 21 artists in a juried art show by the Artist Alliance of the Hill Country; and explore the goods of over 50 specialty vendors and craftsmen. 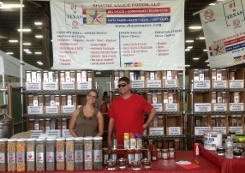 Those of us on the staff of Texas Outside who attended the Festival found the experience fun, interesting, pleasing to the taste buds and very educational. The vintners were thrilled to answer the most fundamental questions and provide information in simple English that a beginner could understand. It was inspiring to see the passion displayed on the part of the owners and winemakers who were present. Our comments that follow about the wineries participating in the Dripping With Taste Festival are not meant for the exceptional wine connoisseur but for people who love wine, are interested in wine, are just beginning to develop a taste for wine or just want to learn more about wine - especially Texas wines. Our remarks are not meant to give detailed opinions of the various wines served but an attempt to give you an example of what is available should you be interested in visiting any of the wineries. We have provided a website link for each winery to encourage you to pick up more information directly from the source of these outstanding wines. Alamosa Wine Cellars out of Bend near San Saba poured their famed Texacaia "Super Texas" wine which is a blend of Sangiovese, Tannat and Petite Verdot. They also served their Amigo Pink made with Viognier and their Amigo Red table wine. Bell Springs Winery is a local Dripping Springs winery. They poured an outstanding Tempranillo wine as well as a Merlot and their Reston Wild West White, a full mouth-feel wine with a sweet citrus finish. Bending Branch Winery in Comfort, provided their Texas Tannat wine (their signature grape) along with a Roussanne wine pressed from this difficult to grow Rhone grape and a Vermentino wine whose grape originates from Spain & Northern Italy. 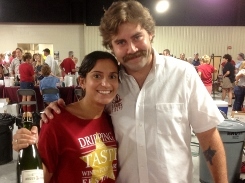 Dionisio Winery has a Houston facility and is owned by 1st generation vintners, Jimmy and Clarice Aranda. They have converted many beer drinkers into wine lovers by starting them on their fruit wine then moving to combo wines like their Pomegranet Zinfandel. Dry Comal Creek located in New Braunfels, served a Demi-Sweet Sparkling Wine which is a 50/50 blend of French Colombard and Muscat of Alexandria. They also provided their popular Foot Pressed Red along with a Red Port. Grape Creek Vineyards in Fredericksburg served a Cabernet Trois which is an interesting blend of Cabernets - Cabernet Sauvignon, Cabernet Franc and Ruby Cabernet. This was a favorite in our party. They also poured a Grand Rouge & Cuvee Blanc. Haak Vineyard from Santa Fe (TX), provided their unique Purple Porpoise NV. While it is similar in flavor and texture to a rose, it has a much darker color, has a medium body and is great when served lightly chilled, just below room temperature. Hawk's Shadow Estate is a new winery right at home in Dripping Springs, poured an Orange Muscat that happened to be my sipping partner's favorite. They served a small sampling of Whole Foods carrot cake that paired extremely well with the Muscat. Hilmy Cellars from Fredericksburg served an interesting combination of a Voignier and Chenin Blanc which they call Doo-Zwa-Zo, a phonetic play on the French words meaning "two birds". These 2 birds were delightful on the palate. Kerrville Hills Winery is a young winery located just north of Kerrville. They served a 09 Purple Cabernet which was voted people's choice wine of the Dripping Springs event. Congratulations! The winner has a rich plum flavor and a spicy dark chocolate aroma. Lewis Wines from Johnson City is another new winery that has done well in its 1st year. Doug & Duncan use 100% Texas grapes and sold all of their production. They served a TX White Blend and a TX Red Wine along with an excellent TX Viognier. Pilot Knob Vineyard is another relatively new winery in Bertram, about 50 miles north of Austin. They served an outstanding Viognier made from 90% Viognier and 10% Muscat. They also presented their Sweet Rose and PK Cuvee. Piney Woods Country Winery is a highly awarded winery from Orange that produces several interesting fruit and Muscadine grape wines. 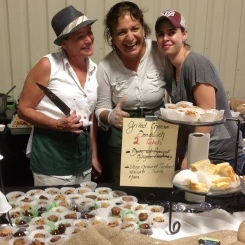 They poured unusual wines including Cherry Chocolate, Chocolate Peanut Clusters and Baked Peach. Pleasant Hill Winery in Brenham is one of the oldest wineries in the Hill Country and owner Bob Cottle poured a sweet Blanc Du Bois. I can't wait to try his suggestion to marinate a fruit salad with this winner. Texas Hills Vineyard is from Johnson City. Besides a Volare and a delicious light-oak Merlot, they served Toro de Tejas, a full-bodied Tempranillo grape from the Texas High Plains. I overheard one taster comment "lovely, simply lovely!" 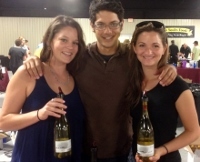 Texas Legato Winery out of Lampasas poured GCP Mirtillo, a Silver Medal winner at the Wines of the South Competition. It is made from Texas blueberries with a grape brandy added. The result is a semi-sweet wine with a terrific blueberry aroma and flavor. Wedding Oak Winery was started by Mike & Lynn McHenry. They have been growing grapes for several years but last year, with a few friends, opened a new, impressive mid-sized winery in San Saba. All grapes are Texas grown for their reds, whites and blush wines. Westcave Cellars Winery in Round Mountain, only 30 min. from Austin, served a pleasantly surprising ruby colored White Merlot. Owner Allan Fetty was extremely helpful in explaining the process of making this unusual wine from 100% Texas grapes. Wines of Dotson-Cervantes have 29 acres of vines in Voca. They served their signature Muscat Canelli wine called Gotas de Oro (Drops of Gold). They also produce grapes (chardonnay, merlot and cabernet sauvignon) for Fall Creek Vineyards. Driftwood Estate Winery in Driftwood served their famous Alamo Red and Armadillo Red along with a Sangiovese wine. The Alamo Red was soft and smooth and also contained a Sangiovese grape. Duchman Family Winery out of Driftwood poured 3 distinctly different wines, Texas Rossa, 11 Trebbiano and 10 Montepuciano. They specialize in Italian variety grapes all grown in Texas. Flat Creek Estates located in Marble Falls, served their Blanco Brio which consisted of 3 Muscats (A Muscat Canelli, Muscat Blanc and Orange Muscat) There was a slight effervescence with bubbles smaller than a sparkling wine. Deliciously different! Messina Hof Winery makes the wine in Bryan-College Station with a second tasting room in Fredericksburg. Besides the fine wines served at each location, they both have facilities for overnight stays. A favorite tasting of ours was their Beau wine. McReynolds Wine from Cypress Mill touts 3 wines - Syrah, Sauvignon Blanc and Merlot. At the event, we tasted the Sauvignon Blanc which is made from California grapes which are fermented, aged and bottled at the McReynolds winery. 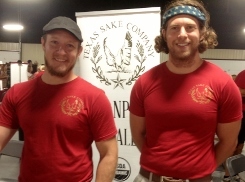 Texas Sake Company is a 2-yr old startup and produces the 1st totally organic Sake in N. America as well as the 1st Sake from Texas rice and the 1st organic alcohol made in Texas. They poured their clear Whooping Crane Sake & their cloudy, coarsely filtered Rising Sun Sake. Argus Cidery from the Austin area, brought only their sparkling Idalou Brut cider. While this beverage is not technically a wine, they use wine making equipment and 100% Texas apples to make a delightfully-delicious, apple-alcohol drink. Beer lovers were not disappointed. Eight beer selections from 5 breweries provided a welcome addition to some of the spicier foods on hand. Thirsty Planet Brewery out of Austin walked away with the people's choice award for their thirsty Goat Amber. They were joined by Twisted X Brewing, Independence Brewing and Jester King from Austin and Real Ale Brewing in Blanco. After tasting over a dozen wines, it was time for a break. It happened to coincide with the 2nd quarter of the Texas A&M - Alabama game. The organizers of the event were thoughtful enough to provide 3 big screen TV's that were conveniently tuned to the game of the week. There was ample seating room and in an area that would not disturb people who were not interested in football (I was told they exist). 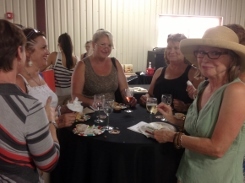 Folks sat around chatting and drinking their favorite wine or beer while munching on everything from cheeses and crepes to pulled pork sandwiches and brisket. Occasionally several enthusiastic fans would jump from their seats yelling like crazy over an exceptional play. They provided an exciting football-wine tasting atmosphere. The restaurant and caterer booths surrounded the winery tables so that people could experiment with the pairing of wines and food. Standing height tables were conveniently placed around the room so that food & wine could be consumed in reasonable comfort. We often found that several unrelated sippers at a table agreed that a certain type of wine seemed to go better with various foods. 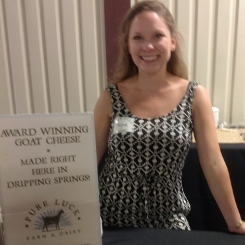 For instance, we sampled a delicious goat cheese that has been produced by Pure Luck Farms in Dripping Springs for the past 15 years. It is a mild goat cheese made with honey, thyme and black pepper. Our table tried 3 different white wines and found one that almost all at the table agreed went well with this cheese. The hands-down winner of the people's choice award for food was Crepe Crazy. While the wait for food at most tables was minimal, the line at Crepe Crazy was constant and could take as much as 45 minutes for a taste of their fare. News of the exceptional food traveled fast. 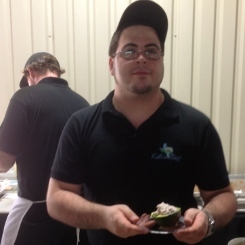 Among some of the other favorite foods, Linda Allen served a spicy pecan smoked brisket and Celtic Seafare provided several salmon appetizers (my personal favorite). There were plenty of sweets to go along with the abundance of sweet wines. My mouth was delighted with the chocolate covered figs from Rolling in Thyme & Dough while others preferred the brownies from Duncan Team Catering or the cakes from Sugar Shack Bakery. I wanted to take one of the 2 wine classes given by Jerel Van Bibber, a Certified Specialist in Wine, but the noise of the crowd of food and wine lovers in the same space made it difficult to hear his talk. The seminars were conducted when the crowds were the greatest and noisiest. Other than some dust created from an occasional strong breeze in the outer hall of the yet to be completed center, this was about the only disappointment that we found with the entire happening. 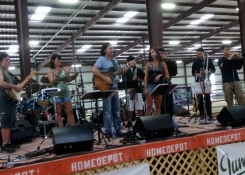 Three excellent bands entertained attendees throughout the day. Lonnie & the Jazzcats played toe-tapping jazz early in the event. They were followed by the huge ensemble Jumpstart. They left us wanting to dance to their lively music but were unable to because of the dirt floor in the entrance area where the bands greeted people. 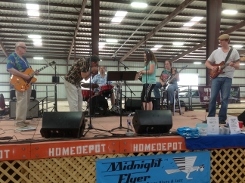 Jumpstart was followed in the late afternoon by a smaller but lively blues band, The Midnight Flyers. 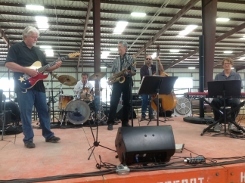 They provided a variety of uptempo blues, R & B and jazz. 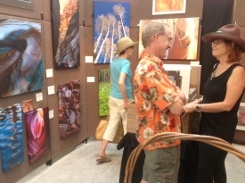 The Art Show featured an assortment of paintings, photography, jewelry and other forms of art from the 21 participants. While there was a variety of art to suit any taste, we were particularly drawn to the work of Austin photographer Alexa Walker. 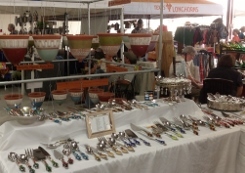 The specialty vendors had plenty of space to demonstrate their products. 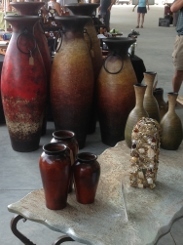 The companies represented offered a wide range of products that appealed to the diverse group of visitors attending the wine festival. As we exited this grand event, we talked about how much enjoyment we crammed into a few hours. While we went for the wine tasting, the food, the art and the music did not take a back seat and provided us with more delight than we had anticipated. 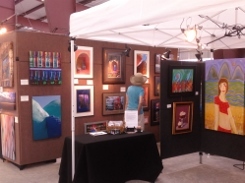 Given the energy and attention to detail demonstrated by the organizers and their willingness to make improvements where ever possible, we eagerly look forward to next year's Festival in the completed Event Center.